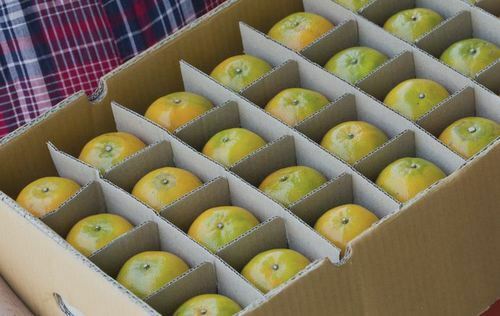 Providing you the best range of Fruit Boxes, Chemical And Pesticides Packaging Bag, Plastic Raw Material, Beverage Packaging Box, Corrugated Box and Apple Box with effective & timely delivery. Hand erect trays are ideal where branding is required and no machines are available for packing. Empire Packages can provide trays made from corrugated board to meet your exact requirements. All such packaging at Empire Packages is designed to meet the physical requirements of the supply chain and to ensure that perishables such as fruit and vegetables arrive in an optimal condition. Hand erect trays and boxes are supplied flat to maximize storage space and minimize transport costs. Our product range includes a variety of containerboard grades and corrugated packaging solutions such as using kraft paper or high GSM recycled liner manufactured to low COBB-60 values (not exceeding 150 gm/m2) that offer optimum protection to chemicals and dangerous goods. By virtue of remarkable utility,exceptional strength characteristics,light weight,and low cost , corrugated fiberboard box packaging materials are extensively used to accomplish industrial packing function. Fiberboard packing materials are used to package a multitude of items differing with respect to shape,size,density,fragility,and weight.In addition to the excellent protective features of corrugated fiberboard box, other advantages of these materials include minimum storage space, low labor cost in preparation for use, and ease of disposal. Corrugated fiberboard is produced in the following major constructions. Wrap-around are precision die cut cartons that are folded directly around the product. This enables the packaging to be extremely tight, as folding tools between product and carton are not necessary. Made from single or double wall corrugated board grades, our X-Large packaging covers a wide range of standard and bespoke styles. All of our X-Large packaging can be glued or stitched or a combination of both in order to give the required performance. Our X-Large boxes are designed to provide the required amount of strength and stability to meet the physical requirements of the product supply chain. The design of the pack, in combination with the selection of the most appropriate grades and materials, will ensure your products arrive at their destination in optimal condition.